Moody's Investors Service expects not-for profit hospitals will continue on their course in 2019 with expenses continuing to outpace revenue, according to its new report. Moody's maintained its negative outlook on the sector as weak volume trends, reimbursement compression, more Medicare patients and growing bad debt loads will limit revenue growth, analysts projected in its 2019 outlook released Monday. Operating cash flow will be flat or slightly decline, hinging on providers' ability to further cut expenses, according to the report. "The margins are at some of the lowest levels that we have seen in a while, but that's more a function of expenses outpacing revenue," Lisa Goldstein, associate managing director for Moody's public finance group, told Modern Healthcare in September. Hospitals are doing a better job of limiting expenses by cutting staff, boosting productivity and squeezing supply costs, according to the report. Salaries and supplies expense growth fell to 6% and 5.9% in 2017 from 7.7% and 8.2% in 2016, respectively. Overall drug price growth will likely continue to slow, which will also help. Total expense growth is expected to drop slightly to 4% to 5% in 2019 from 5.7% in 2017. But that will still eclipse projected revenue growth of 3% to 4%. Inpatient admission will remain very weak, following 2017's median admission growth of 1%, according to the report. Outpatient visit growth will also remain soft, highlighted by median growth declining for the first time in five years to 2.2% in 2017 as the number of outpatient surgeries significantly dropped. More competition coupled with the ongoing shift to outpatient services will suppress margins. Value-based pay models and higher out-of-pocket expenses will are poised to drag utilization. Meanwhile, demand for temporary nurses, continued recruitment of employed physicians, wage increases associated with lower unemployment, innovative specialty drugs and expanded use of medical devices will drive up expenses. Medicare as a percentage of gross revenue rose to 45.6% in 2017 from 43.7% in 2013, according to Moody's data. 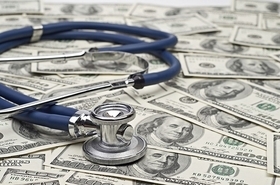 Overall reimbursement rate increases will continue to be in the low-single-digit range. This combined with growing bad debt levels will strain not-for-profits' balance sheets, according to the report. Bad debt levels are projected to grow in the 8% to 9% range as commercial insurers will continue to limit coverage and raise copays and deductibles. Medicare inpatient base rates will grow about 3% in fiscal 2019, a bit higher than in prior years. However, the CMS estimates that about 80% of hospitals will incur readmission penalties of up to 3% of their diagnosis-related group. Site-neutral payments and capping 340B drug discount rates would also hurt not-for-profit hospitals. The uncertain state of work requirements for Medicaid eligibility and a looming reduction in Medicaid disproportionate share funding would acutely impact not-for-profit providers, according to the report. Meanwhile, commercial insurers' negotiating leverage will rise as more Medicare and Medicaid beneficiaries are covered by managed-care programs, which feature lower rate increases and higher denial rates. Certain hospitals will face additional margin constraints as budget-strapped states seek to reduce spending on their employee health benefit plans, analysts said. Not-for-profit hospitals will still seek scale to alleviate financial pressures, according to the report. But the jury is still out on long-term savings for larger systems that acquire struggling, Goldstein said. "Day 1 integration is key to making these deals work," she said. "We've seen mergers go very smoothly; we've seen mergers over the years that have been wobbly coming out, and some have been very difficult."